World Elder Abuse Awareness Day was marked on the 15th of June, with people around the world pausing to acknowledge this important issue. Elder abuse can manifest in many ways, including physical, financial, psychological, social or sexual abuse, as well as neglect, with financial abuse being the fastest growing form of elder abuse in Australia. Justice Connect’s Seniors Law took the opportunity to celebrate more than 12 months operation of its first health justice partnership (HJP), with cohealth, a rights-based community organisation of more than 850 staff, and delivering health services from over 40 sites across 14 local government areas in northern and western metropolitan Melbourne. 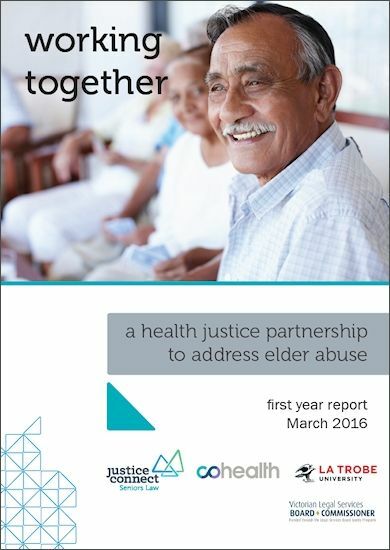 The one-year report of the program, “Working together: a health justice partnership to address elder abuse” sets out how the HJP was developed and looks at its impact. This partnership commenced in early 2015 with a lawyer from Seniors Law based at cohealth four days a week. It was supported by three year funding from the Victorian Legal Services Board who agreed to fund the development of nine (9) HJPs. Both partners agreed on the shared aims and objectives of the partnership based on a healthcare delivery model integrating legal assistance as an important element of the healthcare team. To achieve these objectives, the partnership involves six key areas of work: governance, evaluation, communication, professional development, community legal education (and legal help). Interestingly the report shows that the most common form of legal help provided was secondary consultations with health professionals for their clients. 40% of these secondary consultations were eligible for the legal service, with the remaining matters being referred to legal or non-legal services. The report paints a picture of pro bono lawyers learning to work together with social workers and other health professionals to provide the program and makes the point that the involvement of health and legal professionals in delivering professional development sessions is a vital component of the HJP model. These integrated arrangements aim to simultaneously provide better health outcomes and access to justice for patients with legal issues, affording victims of abuse the opportunity to access legal assistance without alerting abusers. Such a partnership is particularly important in the context of elder abuse, a form of abuse that is often hidden and difficult to detect. By working in the health care setting, it is hoped that the health justice partnership will enable the identification of the signs of elder abuse, and provide rapid, confidential, and holistic legal advice and other support to the patient. Pro bono lawyers were an integral part of the model, with legal services being provided by Justice Connect’s Seniors Law lawyers, as well as pro bono solicitors from Lander & Rogers, Maddocks, Holding Redlich, Hall & Wilcox and Thomson Geer. Pro bono lawyers were trained by members of Justice Connect’s Seniors Law team on elder abuse and other legal issues associated with ageing, including guardianship, powers of attorney, housing and credit and debt. Further information about the partnership, and other HJPs including information for pro bono lawyers, can be found on the Seniors Law section of Justice Connect’s website.